I’ve worked on this for quite a while and yes now it’s coming! As a guitar teacher, guitar player and blogger I see a lot of guitar players are using the pentatonic scale for soloing and improvisation and that’s great because it’s a very practical an important scale that can be used for a lot of styles like blues, rock, metal, pop, country, etc. For me it was also the first scale I learned, but after some time I noticed I got stuck soloing in just one position/shape for too long. I knew a few ways to break out of that shape area, but that was pretty much it. I felt limited. I did know how to play the other pentatonic shapes but it was hard to make nice melodies or phrase fluently with all the other shapes. Somehow they didn’t seem to work really well. Until I started learning the blues scale shapes and how to use them for improvising. It opened up a whole new world of possibilities. I was able to solo across the entire fretboard, it felt so natural and easy to do. It completely changed the way I was playing. 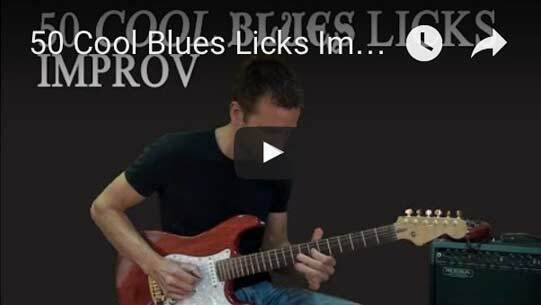 I want you to learn what’s behind the licks, how to break them up, turn them around, make up new ones, create different combinations and learn to play everything in every key like a real pro. And those tools will be the perfect recipe for the chapters that follow, where you will learn how to play the 5 blues scale shapes all explained slowly in close up with effective exercises, tips, tricks and improvisation examples to master the blues scale inside out. If you think this is for you, this is the time to really take your improvisation skills to the next level. 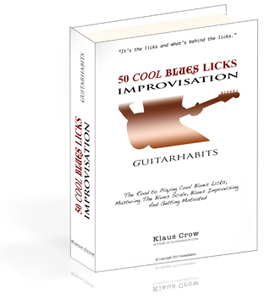 I know you are used to my free guitar lessons and they will sure continue to be, but because of the hosting, traffic and other costs that came up with the making of “50CBLI” and to keep the Ebook, play along tracks and more than 190 minutes of video lessons online for download I charge a rather small price of $69 dollars.